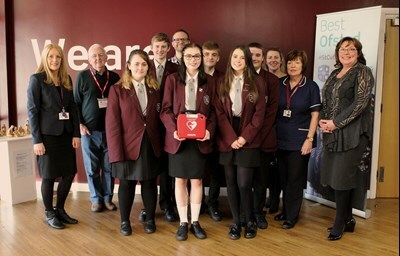 St.Cutberts's Secondary School has acquired a defibrillator thanks to a donation from Sutton Village Church. The potentially lifesaving equipment will be able to be used in emergencies for students, staff and visitors to the school, and will also be available for the community as a whole. 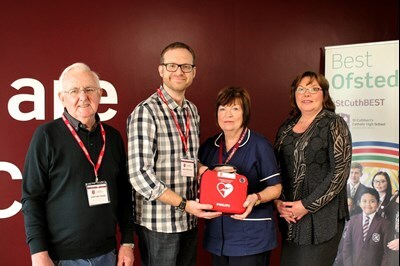 The donation also includes funding to train six people on the use of the defibrillator. Chris Milow, whose daughter attends the school on Berry's Lane, Sutton, is one of the leaders at the church. He said "Several of the children who go to our youth groups are pupils at the school and we felt that this was an important piece of medical kit to have on site." Head teacher Catherine Twist added: "we are so lucky to have received this very kind donation from members at Sutton Village Church, one which will benefit the community as a whole and also will allow St. Cuthberts's to have a role to play and a legacy to potentially save lives." Article featured in the St.Helens Star. Website developed by Nathan Topping.